What a brilliant book! 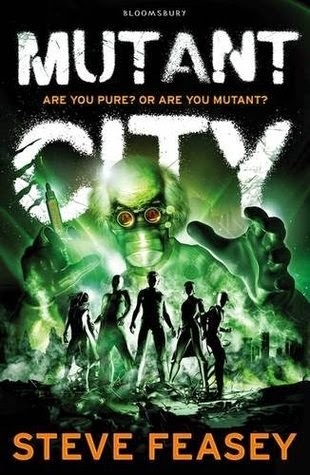 Mutant City by Steve Feasey is set in the future after a devastating war. Humans are divided into two groups; Mutants and Pures. It follows a group of teens who are being hunted for their amazing abilities. Their abilities were engineered to be used for nefarious purposes. Though they are rescued and hidden away for years, this soon changes. Their maker needs them and he will stop at nothing to get them back. Not only was Mutant City fantastically plotted but I felt for the characters and couldn’t wait to see what would happen to them. The story follows various points of view which seamlessly tie together. It is the perfect balance of action and emotion. I loved to witness the development in the friendship between Rush and Brick; two of the mutants. Mutant City is realistic in that not all Pures were bad guys and not all the Mutants were good. Feasey’s descriptions of action scenes were great. I could imagine everything very clearly. My favourite thing about the book is the way he explained the mutants’ powers. While they were not the most original powers; he described the way they manifested in a very unique way. The story was fast-paced and therefore a quick read; I wish it had been longer! I would have liked to have seen more of the city that the Pures live in. Also, I would have liked to have read more about the other mutants in the group apart from Rush and Brick, so I could really understand them, their feelings and motives. But, as I know there will be a sequel, I have an inkling that this is where the other characters will develop more fully. As well as this, I realised some of the twists that happen at the end of the story before they happened, which slightly took away some of the surprise in the story. Nevertheless, there was one twist that left me gobsmacked. Overall, the book was fantastic and I cannot wait to read more from this series.